City of Malolos - The Sangguniang Panlalawigan of Bulacan spearheaded the province-wide kick-off activities for the celebration of “Lung Month” this month of August to promote the Fight Against Tuberculosis with the simultaneously held TB Caravan and Talakayang Bulakenyo in the four districts of the province last August 18, 2014. These activities were parts of the month-long activities to be implemented by the Bulacan Multi-Sectoral Alliance (BMSA), an organization composed of various government offices, non-government organizations, people’s organizations and other concerned sectors of the society for the purpose of reducing and eventually eradicating tuberculosis that kills millions of people worldwide and enhancing the awareness of Bulakenyos about the said illness. The Sangguniang Panlalawigan, represented by SP Secretary Ma. Perpetua R. Santos and some staff of the Office of the Secretary to the Sangguniang Panlalawigan, was joined in the motorcade by the Bulacan Medical Center (BMC), the lead office of BMSA, the Philippine National Police (PNP), the Department of Labor and Employment (DOLE) and the Bureau of Jail Management and Penelogy (BJMP)-Bulacan. 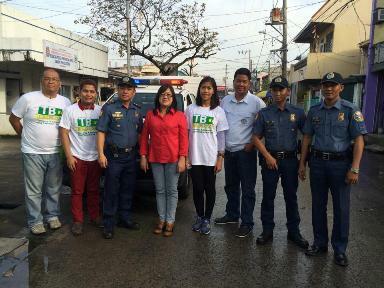 The caravan assigned in the fourth district plied the streets of the municipalities and cities of Obando, the starting point, Meycauayan, Marilao, San Jose Del Monte and Santa Maria, the designated host municipality and venue for the Talakayang Bulakenyo. The caravan started at 7:00 am and arrived at the talakayan venue at around 10:00 pm. Upon arrival at the Santa Maria Covered Court, the Talakayang Bulakenyo followed. Aside from the BMSA members who prepared and presided over the talakayan, invited participants in the two-hour long Talakayang Bulakenyo were Dr. Estelita Bautista, Municipal Health Officer of Santa Maria, the main resource speaker, the Lingkod Lingap sa Nayon (LLNs), Mother Leaders, Barangay Health Workers and other health workers coming from the 29 barangays of the municipality. Said affair was also graced by Mayor Bartolome Ramos of Santa Maria and Councilors Roberto Perez, Froilan Caguiat and Renato De Guzman, Jr. The activities ended at around 12:00 noon.